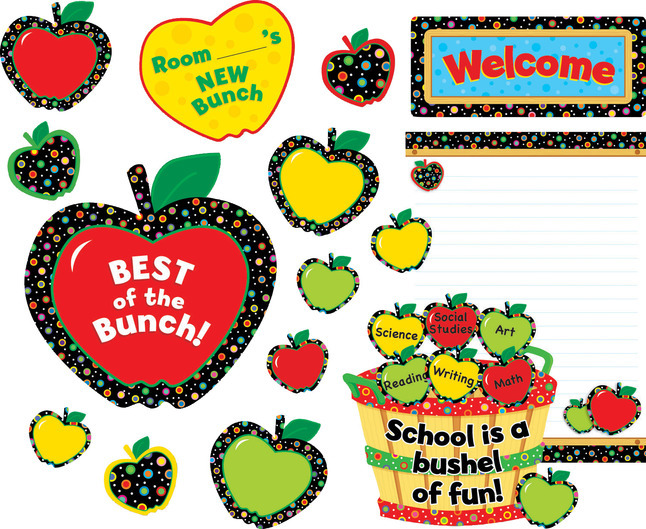 Welcome your new students with this Poppin' Patterns Back-to-School Apples Bulletin Board Set. Use these colorful pieces to spice up your apple-themed unit! This 44-piece set includes: A welcome sign (13 x 5-1/2 inch), a coordinating apple with interchangeable message piece (14-3/4 x 14-3/4 inch), an apple basket (12 x 10-1/4 inch), 30 student apples, 9 accent apples, a writing chart (17-1/2 x 24 inch), and ideas for display and use. Coordinates with Poppin' Patterns products.